The Makita 2705X1 is the best portable table saw. This 10-inch model is powerful and versatile. It can be used at the jobsite or shop. It comes with wide range of awesome features designed to ensure convenience and ease-of-use. In addition, the tool is capable of reaching 4,800 RPM thanks to its 15 AMP motor. The 2705X1 model features an electric brake aimed at maximizing productivity. It has the capacity to rip 4X material in one pass as well as use the 13/16″ dado blade. Contractors can take advantage of the blade guard system, which comes with adaptable dual side guards. This makes it easy to measure all the way from the blade to the rip fence. It can handle through cuts using the riving knife or spreader in addition to the stowable anti-kickback pawls. The riving knife or spreader allows users to adjust it to three positions. This is designed to make it possible to handle dado, through and non-through cuts. The adjustments do not necessitate the removal of the throat plate. What Makes This The Best Portable Table Saw? The 10-inch table saw is a must-have tool for any carpenter or contractor. The unit is easy to assemble. You simply attach the tilt wheel, the rip fence and the height adjustment wheel after mounting it to the stand. Once assembled, you then check the alignment. The table top is precision machined to ensure a truly flat surface. This makes it easy to achieve accurate cuts every time. It also boasts a 3/8 inches x ¾ inches T-slot miter gauge for precision adjustments. The gauge has grooves that help cut material properly. As a result, you can handle any wide crosscutting task. The rip fence aids the precision adjustments by sliding across the table top. The 2705X1 is engineered to serve the needs of general contractors, furniture makers, flooring contractors and more. It offers a number of convenience features like the large on and off switch. In addition, the table saw has an easy to read scale that simplifies adjustments. When it comes to storage capacity, it can hold the majority of accessories, including blade, miter gauge, wrench, power supply cord, rip fence and more. The tool’s spring loaded system allows easy storage. Its portable stand is durable. It is fitted with heavy duty wheels and has a powder-coated finish. 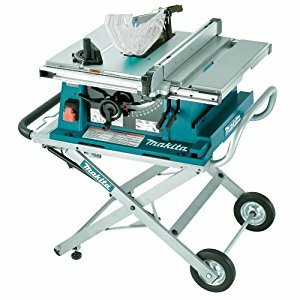 The Makita 2705X1 10-Inch Contractor Table Saw with Stand is arguably the best on the market. It comes with an extension table. This awesome feature allows you to rip a full sheet of plywood. Such a capability sets the model apart from other table saws. The table’s depth enables users to cut materials that are 3-9/16 inches, which is amazing. The majority of table saws are designed to only cut 3-1/8 inches at 90 degrees.